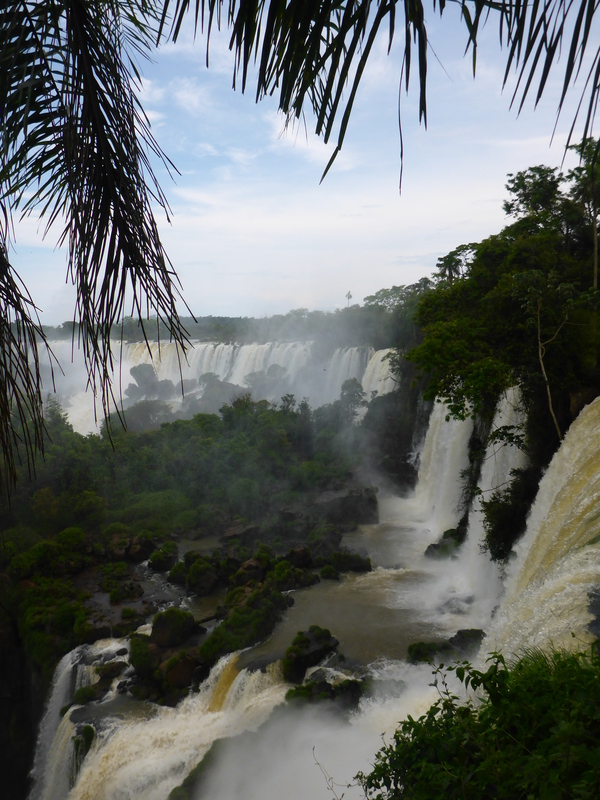 For me, day two at Iguazu Falls was the best day yet. It was one of the most beautiful places I’ve ever been; I’m so glad we decided to stay a second day. 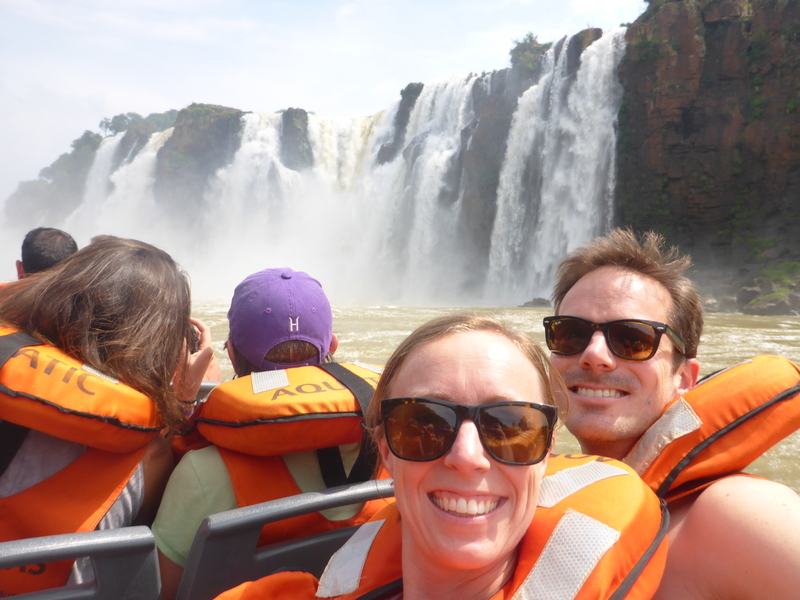 The Iguazu River forms a border between Brazil, Argentina, and Paraguay, so you have lots of options in this area. 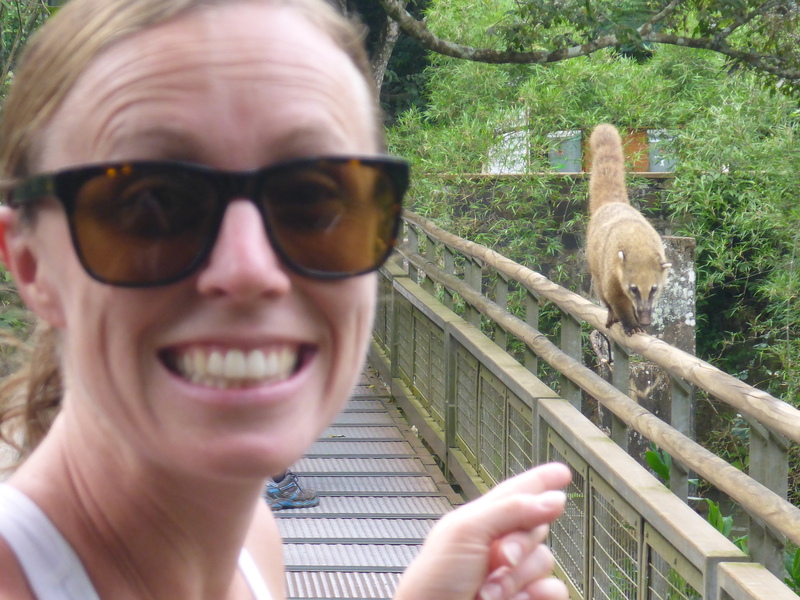 We stayed on the Brazilian side, so the first day it was easy bopping around on the local buses to get to and from the national park. Day two we planned to travel to the Argentinian side which meant we had to take the international bus across the border. Once we reached Puerto Iguazu, again, the bus driver gave the “everybody off” holler and told us that we could catch another bus to actually get to the falls. Of course there were plenty of taxi drivers milling about the bus stop preying on tourists like ourselves, and since we’d gotten a bit of a later start than we anticipated, we gave in and grouped up with another couple of tourists to share a cab into the park. The entire way in the taxi driver was explaining to us how he could give us a better exchange rate than the cambio or the ATM at the park, and how we should change money with him, and on and on and on… of course, since we had arrived in Argentina without any Argentinian Pesos, and since we know better than everyone, we ignored him and proceeded to the ATM. Which didn’t work. And the cambio was closed. And the ticket booths didn’t take cards. Fail. 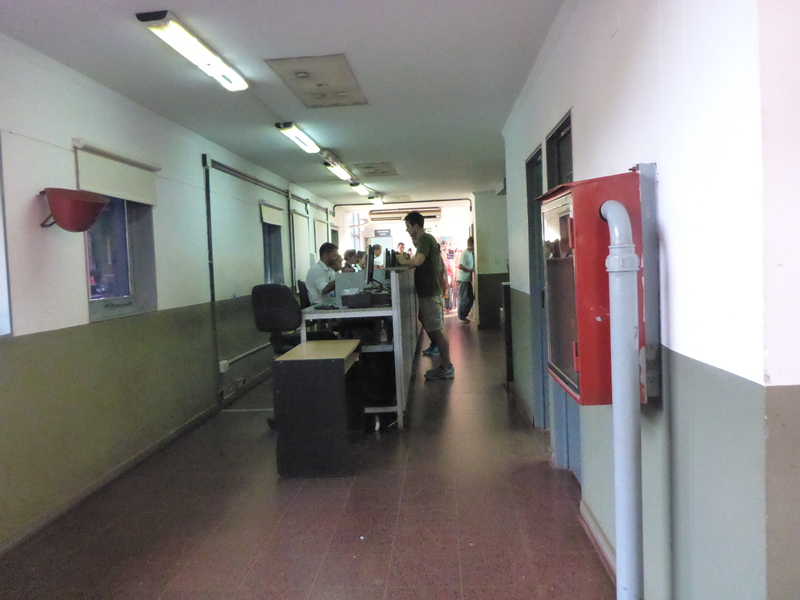 So… feeling like we had botched the whole day we approached the ticket seller and offered any of the other currencies we had in our wallets – US dollars, Euros, Chilean dollars, Brazilian reais… thankfully, he agreed to convert our reais, and we were made our way inside! Wolf wisely suggested that we book a lazy river paddle adventure, then do some walking, followed by a speed boat ride and a hike back. He’s a pro, because the day was perfect. 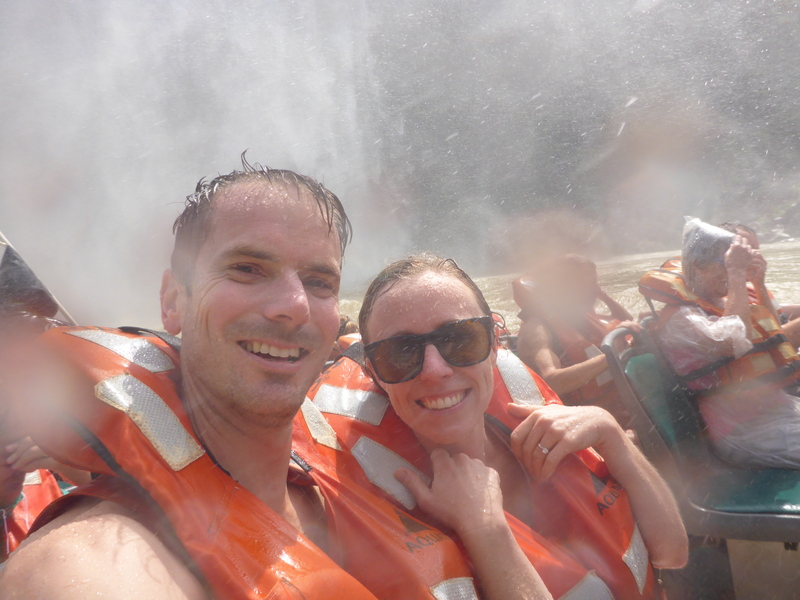 We took a nice little nature walk on our way to the train (which reminded me a lot of the train at the Santa Barbara Zoo) and then donned life jackets and jumped into a big inflatable raft for our jungle cruise. 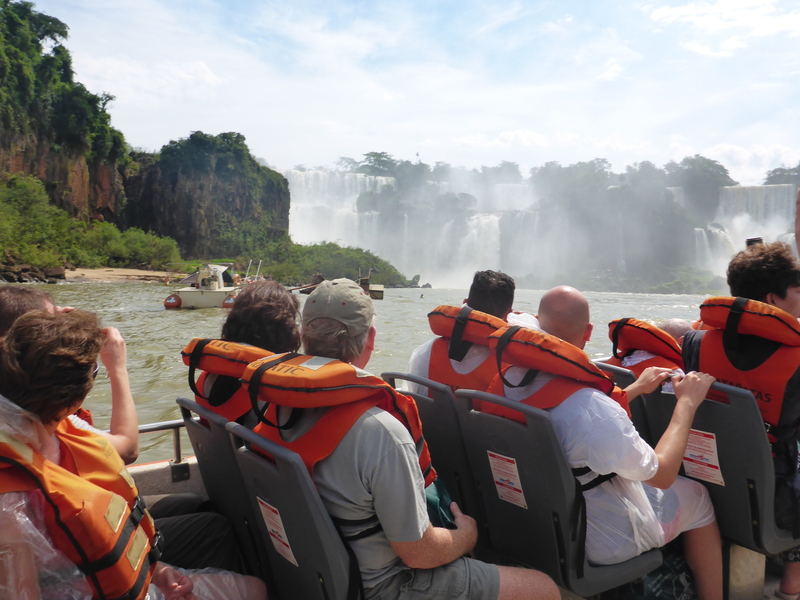 Since we started from the top of the park we floated out so we could see the drop-off of the falls ahead and then floated through a side channel with beautiful trees and vines along each side and butterflies everywhere – every color shape and size. 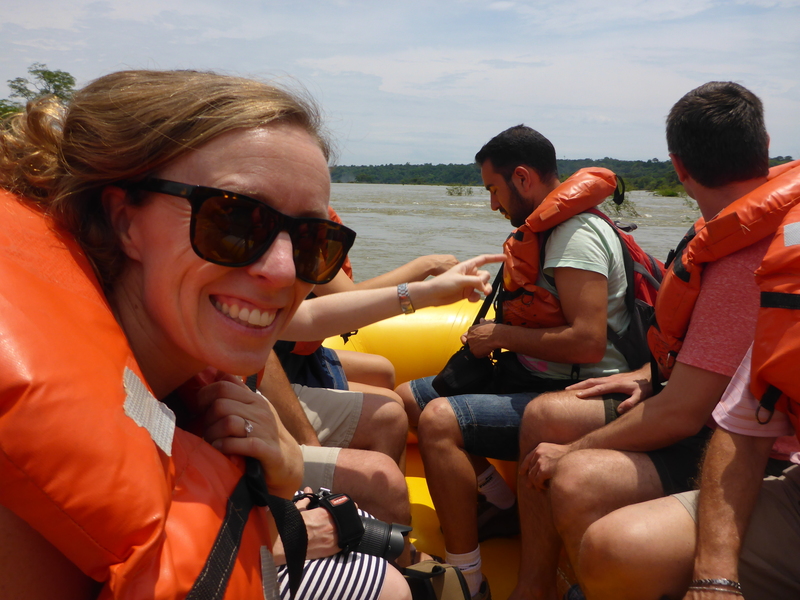 We walked back along the river, surrounded by jungle, and took a quick lunch break. After thoroughly soaking everyone on the boat we backed out and everyone on the boat started chanting for another go. We raced around the corner to another section of falls and did the same thing again. 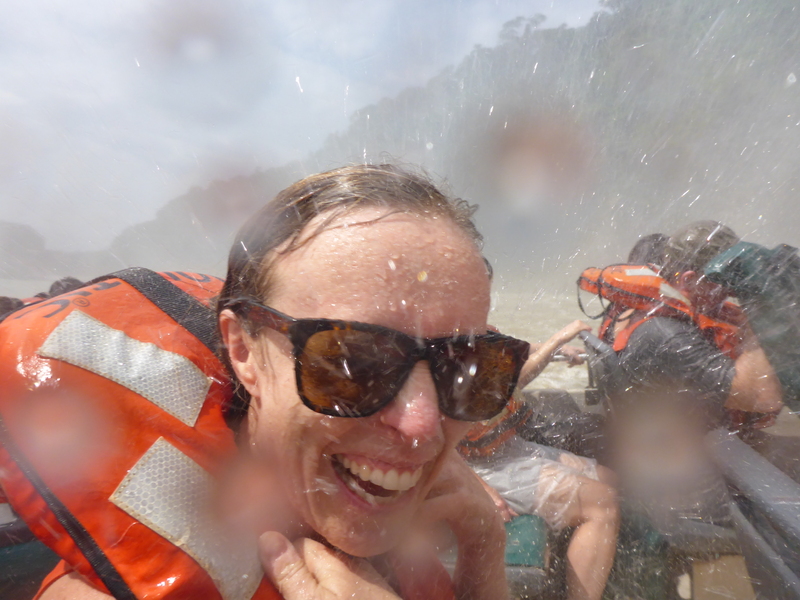 By the end of the boat ride I was sopping wet and laughing hysterically. The whole thing was completely touristy and cheesy, but also unexpected and a complete riot. For your viewing pleasure, a bit of the video Wolf took of our lead up to the boat ride under the falls. We disembarked at a dock near the base of the falls. I certainly had a bit of adrenaline going from the boat ride, and this, coupled with a sort of euphoric high after the shock of cold water and nice little shower, had cleared my head nicely – a perfect preparation for the remaining hike. We ended our day with a hike that meandered to the base of the falls, picking our way between boulders and greenery, all while admiring the odd rainbow that formed in the spray from between palm trees and orchids… the whole thing was beautiful. Like something out of Jurassic Park. Or another world all together. Lush, and green, but also rocky and rugged, and moist and inspiring… I didn’t really want to leave. The rest of our hike brought us up to the top of the falls, where we could walk along bridges and peer out over as the water dropped off… all sorts of sights that I have a hard time capturing and describing, let alone photographing. Perhaps the icing on the cake at the end of the day were a few moments that seemed to be straight out of National Geographic. As we walked along a quiet trail, one of the park employees in front of us suddenly turned around, told us to be quiet, and pointed out a caiman basking on the banks of the river. He slid into the water as soon as he saw us, but we were so excited to see the little guy! Then, we rounded the corner to see a group of coaties wandering around. 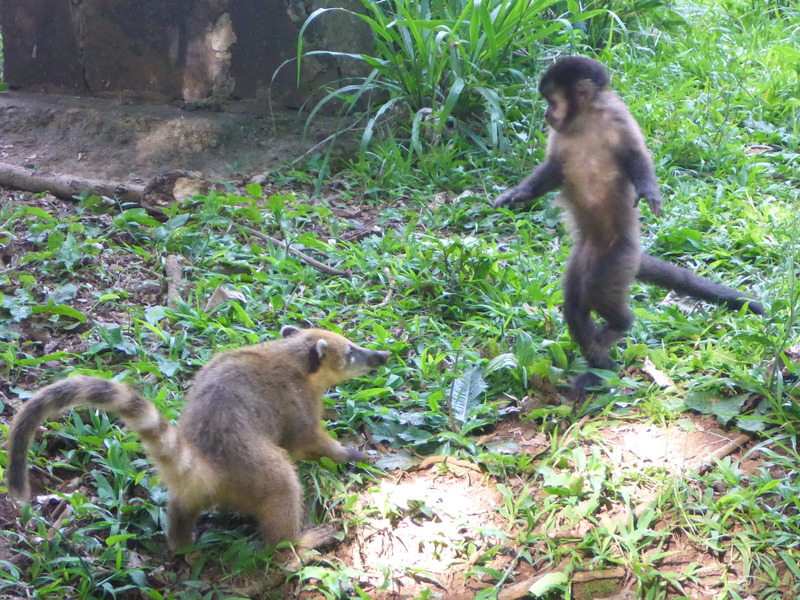 Since they seem to be as common as pigeons or squirrels, we didn’t take too much notice, until a monkey came out of the bushes, followed by a huge lizard… and then they were all playing, or fighting, or who knows what but it blew my mind! After showers, we walked back to a local-looking joint we had walked by the night before and celebrated an awesome day with an awesome dinner, punctuated by outbursts from the surrounding tables every time Brazil scored in the soccer game playing on TV. Perfect end to a great day. Next Next post: Rio de Janeiro!